If there’s one thing I’ve learned about the cat-eat-cat world of accessories modeling, it’s that the cats will always win. 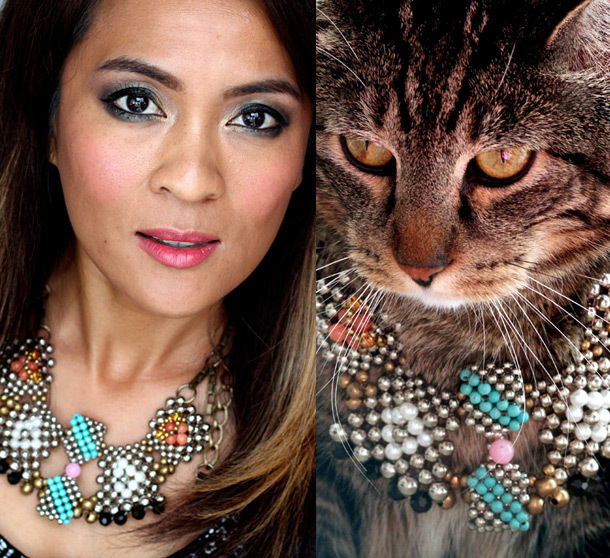 Modeling necklaces like this Pam Hiran bib from Anthropologie happen to be one of Tabs’ fortes. I know that the chances of me taking this round are slim. I mean, how’s anyone supposed to compete against that silky fur?! It’s unfair! Who wore it better: Tabs or Karen? In other news…this behind-the-scenes video of Francois Nars shooting the NARS fall campaign doesn’t have anything to do with cats or bib necklaces, but I thought it was pretty rad. Previous Post: How Do You Line Your Eyes? Oh no this is too hard! Both of you look endlessly fab with it! Don’t make me choose! Scherbs voted for Tabs! I can’t pull off the statement/bib necklaces! It’s just not me! Both of you are working this, but I had to vote Tabs! I can’t decide! You both look so good. loved Karen and Tabs, do not have how to choose, I’ll vote for Tabs, this necklace was perfect! beijosss Karen and her beautiful Tabs! You both look great! Love the necklace! I voted Tabs 🙂 because cats are Gods/Godesses and gods often wear jewels, that’s why^^ ! Sorry Tabs, I think Karen’s eye make-up put it over the top. Sorry Karen, of course Tabs wore it better. It’s a mistake for you to even think you could pull it off as well as our supermodel kitty!